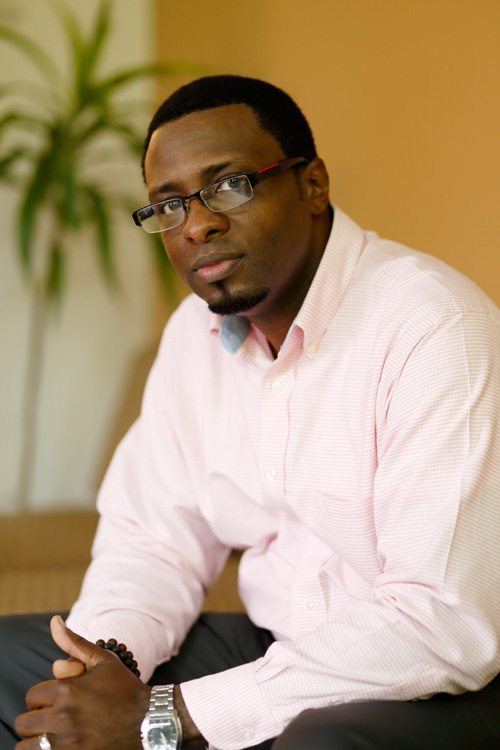 Tyron Cooper is an assistant professor in Indiana University’s Department of African American and African Diaspora Studies and serves as the director of IU Soul Revue. He’s also a devoted mentor, composer, ethnomusicologist and performer. Tyron Cooper is the director of IU Soul Revue. Photos by Eric Rudd. 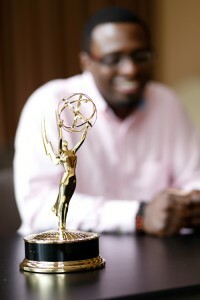 And, since Saturday, he is the winner of two regional Emmys. “It is gratifying to know people are experiencing your work and acknowledging something you created,” he said. In their own ways, both programs are Indiana stories. Leonard was born in Terre Haute and played basketball on Indiana University’s 1953 NCAA national championship team. But, he didn’t stop there. He overcame his early hardships and eventually played professional basketball, coached the Indiana Pacers and later became a beloved announcer. “Strange Fruit” tells a more somber story. The segment from “The Art of the Matter” commemorated the 75th anniversary of Billie Holiday’s signature song, sharing the dark and haunting story behind it. Despite its lyrics mentioning “the Southern breeze,” the song was based on the 1930 lynching of two young black men in Marion, Indiana. At the end of the segment, Marietta Simpson, a professor of voice at the Jacobs School of Music, delivered a moving version of “Strange Fruit” with Cooper accompanying her on guitar. She also won a Lower Great Lakes region Emmy. “Bobby ‘Slick’ Leonard: Heart of a Hoosier” also earned Emmys for its writer and producer, Ted Green, in the Documentary and Writer-Program categories. Before the premiere of “Bobby ‘Slick’ Leonard: Heart of a Hoosier,” Cooper spoke about his writing process in an Art at IU article. Now, as he looked back, he said, “It challenged me to pull from everything I understood about the social and political aspects of various historical moments over the span of his (Leonard’s) lifetime. “In the process of producing the soundtrack for his life experiences, I identified so much more about the broader American fabric. That, in turn, sparked my creativity to the fullest extent that I could offer at the time,” he said. Cooper said he greatly appreciates the opportunity to combine teaching with his other musical endeavors. In other regional Emmy news, WTIU also won an award for the “Renew and Reclaim” episode of “The Weekly Special.” Among other stories, the program featured Delta Upsilon cyclist Tom Larson, who raced in the 2014 Little 500 after receiving a triple organ transplant.